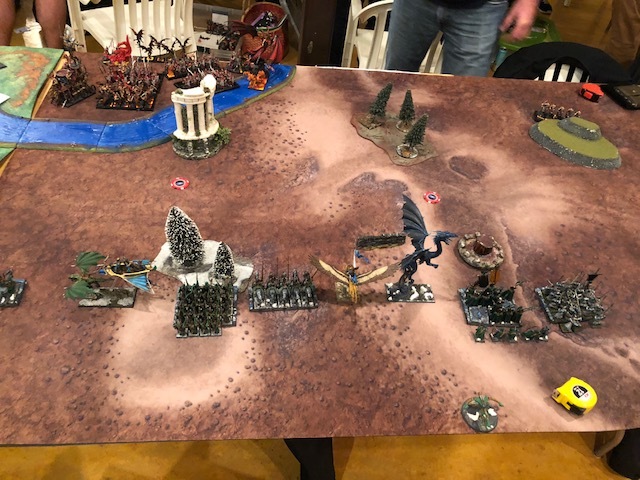 I attended a 5 game 4 person team tournament the second weekend of December put on by a our very own clubmate Kenyon. This tournament was really well done, good venue, food provided on site, near to primary transit routes, great terrain/tables. I have to caveat my games by saying that I came down with a nasty cold which hit me the morning of Saturday and Day 1. I really hope I didn’t get anyone sick, because I ended up taking a day off work as a result. But I did get in 4 games, it worked out that our round 5 pairing had a player drop and I graciously accepted to bow out of the 5thround and go home and rest. my role as the pseudo shield list (I was thrown out first in 3 of 4 rounds) was not a great strategy. My army and Jake’s are somewhat similar with three infantry blocks and a few big hitty pieces with moderate shooting. I liked the Wardens and Frosty a lot in this match up and wanted to get that combo charge off on one of his big spear blocks. I decided to drop everything for first turn as it was spoils of war scenario and I knew how I wanted my units lined up to contest the objectives. Jake counterdeployed and corner castled around a water feature and a piece of impassable. This essentially neutralized my shooting from having much of an impact on this game as one of my bolt throwers was out of range. Unto the Breach Dear Friends! Evana bent low over the green scales of her dragon’s neck as they cleared the top of the ruined tower and banked low into an attack run on the female gladiators. Joined by her elite house cavalry, the gleaming ranks of citizen spears and a sky sloop they massacred the elite warriors leaving a paltry few to flee before their onslaught. That brief moment in time, the decision point on what to do would forever remain in her memory…watching the retreating survivors she judged it extremely unlikely they would make it far enough to clear the next rank of dread elf reserves protecting the bolt thrower emplacements. Those reserves would likely be fouled up with the retreating gladiators and unable to react to her forces sudden breakthrough. Just like that… time returned to normal pace and she ordered her troops forward. Even as her shock cavalry fell just short of making it to safety at the edge of the battlefield she saw the gladiators chaotic retreat turn into a savage sprint as they hurdled over the gun emplacements to safety. Strung out of a cohesive battle line by their burgeoning pursuit her forces were caught completely surrounded by the dread elves reserves. As she watched the counter-charges smash the sky sloop to the ground and chase her house cavalry off the battlefield she knew she had failed. She signaled to her cousin and retook the skies. Even as she retreated, the infernal altar of sacrifice gave chase, the priestess deliberating over its cauldron had her eyes fixed on Evana’s. The timely intervention of her cousin and his Wardens broke off the war engine’s pursuit, the priestess’ eyes smoldered in hatred as their dancing green blades drove her followers off. This ended as a 15-5 to Jake, a disappointing result. The story above covers the critical moment of the battle. I had all but wiped out his dancers unit taking minimal damage in return and had bubble scrying up from my griffon mage. If his dancers roll a 10 or less they land right in front of his flaming spear unit which would then be unable to countercharge my victorious forces. He rolls an 11 and flees off the board. That’s ok, my Ryma Knights need a 9 on their overrun to get off the board and avoid retribution for a turn, roll an 8. That’s ok, sloop needs a 9 to overrun into the flaming spear unit and hold them up from charging, rolls a 7. Next turn, victorious divine altar after crushing the sloop, overruns into the flank of the spearmen who fail their ld 7 minimized steadfast and flee off the board. At that point I’d lost over 1000 pts in exchange for 500ish and taken 3 wounds on my griffon mage from some lucky bolt throwers. I managed to contest the objective, but I ended up down by 1700ish points at the end for a 15-5. It was a great game and we had a good time even with all the swinginess. I’d made a conscious choice to bet big to win big, and I came up short. If I’d blown through on my left flank as I’d had the potential to do, I could have had half his infantry units, his wizard master and his fire base snapped up by Turn 3 and a potential big win on my hands. As it happens I do have some epic tales to tell from the next game!